How Do You Keep Your Dogs So Trim? You are here: Home / Dog Health / How Do You Keep Your Dogs So Trim? I get that all of the time. I tell people “I starve them”. I am joking of course, but there is some truth to that. When I tell people that I ration my dogs food I typically get some variation of, “Oh, my dog would never go for that. My dog is always hungry so I leave food in his bowl all day” as a response. 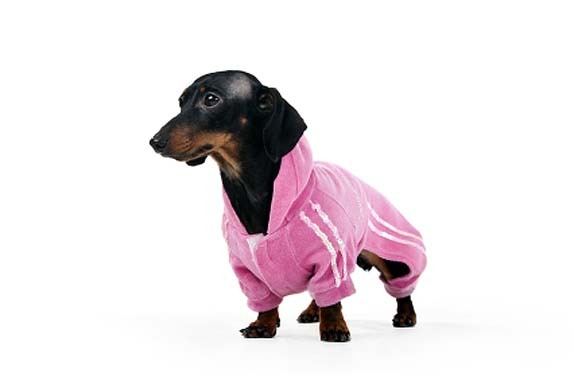 Um, sorry, but no wonder your dog is overweight. Just like people, keeping fit and trim is just simple math. Calories in have to equal calories out. Chester and Gretel would eat all day too if I let them. Sure, they try to tell me its food time all day. They even get real persistent. But, like a good parent I know what is good for them and I don’t give in. There is no doubt that a healthier dog generally lives longer. One article I found said that dogs fed to “ideal body condition” lived 1.8 years longer than their overweight litter mates. That’s a bonus of nearly 2 extra years of life, just for keeping your dog close to his ideal body weight. I know that food equals love to some people but wouldn’t you rather your dog be with you longer? The majority of commercial dog food formulas include a weight chart that will allow you to figure out about how much of that particular food your dog should be eating each day. However, there is a general rule that you can use as far as portion size. If your dog weighs up to 10 lbs, you will want to feed them around one cup of food per day. If your dog weighs from 10 to 25 lbs, you need to feed your dog from 1 ½ to 2 ¼ cups per day. Remember, these are just GENERAL guidelines and you may need to adjust portion sizes based on your own dog’s needs. For example, the metabolism is slower in an older dog so you may need to feed them less. If your dog is inactive they will require less food. If your dog is very active or competes in agility you will likely have to increase their portion sizes. I use my dogs ideal weight as a gauge for adjusting their portion sizes. There are several methods you can use to determine your dog’s ideal weight. I use a simple method that my vet recommended to me when Chester was a puppy. 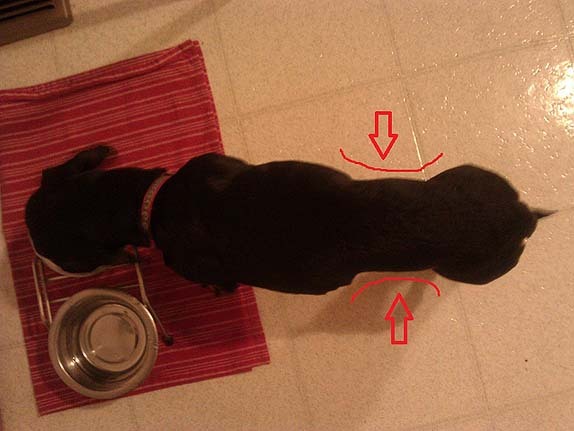 A healthy weight for dachshunds is when you can see their ribs poking out a little. 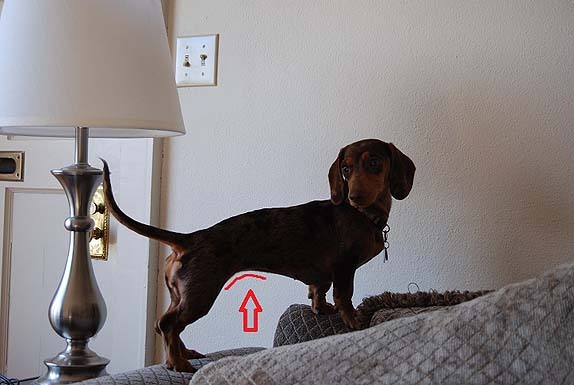 If you view your dog from the top, they should have a clearly defined waist – wide in the front, narrow at the waist and wider again at the hips. If you view them from the side, you should be able to see the upward tuck of the abdomen. An overweight dog will have very little or no tuck. I watch my dogs and adjust their food accordingly, always keeping those guidelines in mind. When they get a little plump I cut back. If they start to look to skinny I give them a little more food or increase their treats. Could your dog stand to lose a pound or two? Gus successfully lost a pound last year. It was surprising for us to learn at a vet appt that “he could stand to lose a pound”. He is walked 3x daily with extra long walks on the weekends and isn’t a big eater during meal times. (we actually cheer if he finishes a portion). We feed veggies as snacks, but we realized he was probably getting way too many treats throughout the day. We’ve since cut back (break everything in half or thirds) and it did the trick! I know what you mean. I thought Chester was in pretty good shape too until we got skinny Gretel. I still didn’t think much of it because Gretel was too skinny. But then I saw the poster in the vet’s office when I took Gretel in and realized Chester was tubbier than he should be. I can’t believe he lost three whole poounds though! Great blog! Good for you for keeping your doggies fit and trim. I am constantly weighing and putting my hands on Sherman and Leroy to make sure they are staying fit and trim. You can’t see the tuck on them due to their heavy coat so a hands on approach works well for me. I take them into the vets to be weighed every few months too just to be safe and adjust their food intake and exercise as needed. They don’t eat as much as people think, actually I see overweight labs in at the vet all the time that eat more than them!